Looks like we're back to a more familiar release schedule in Japan, but the number of new DSiWare releases is more than normal with 9 new titles (though it has to be admitted two of these are guidebooks). The Virtual Console releases include Tecmo's second offering for the VCA: Ninja Ryukenden, which gamers elsewhere will recognise as Ninja Gaiden. The other title is the latest in Namco's never-ending series of VCA titles: Phelios, which has already had a Mega Drive port released on the Virtual Console in Japan; though given the amount of sprite scaling happening in this shooter the arcade version is undoubtedly the one to get. As with all Japanese VCA titles these will be 800pts each. Tomy Car Driver (1000pts - Takara-Tomy) -- A collection of mini-games based around three emergency vehicles: fire truck, ambulance and police car. It looks like there's a driving segment followed by games like putting out fires. Playable with 1-2 players and featuring virtual vehicle cards and more mini-games to unlock. Karaoke Joysound Wii (1000pts - Hudson) -- This is the WiiWare version of the disc game which was released last December. The primary difference appears to be a redesigned interface, so the WiiWare game plus a separate purchase of the required external USB microphone (3000 yen) looks like a better deal than the disc+mic option at over 6000 yen. You'll have access to some 50,000 tracks initially with the promise of 1000 new ones every week. You get a 3 song trial included, but after that tickets must be purchased to access songs which are available in 1-, 3-, 30- and 90-day amounts costing 300, 500, 1000 or 2000 Nintendo points each. The title supports 1-8 players and appears to be the ultimate Wii karaoke title with performance scoring and online leaderboards. Okiraku Tennis (500pts - Arc System Works) -- The latest entry in the "Family" series of games from Arc System Works, with this one being focused on Tennis. No doubt like other titles in the series this will end up coming to WiiWare services overseas. On Wednesday the DSiWare releases will include two new entries in the Pocket Rurubu series of holiday guidebooks which Nintendo are providing on DSiWare for 800pts each. May saw the release of guides for Tokyo and Kyoto; this month's guidebooks cover Hokkaido and Okinawa. Also for 800pts is Card Hero Speed Battle Custom which looks like a card battle game with the fight action being carried out in the top screen whilst the card is displayed on the bottom. This is the DSiWare follow-up to a 2007 cart release from Nintendo called Koosoku Card Battle: Card Hero and appears to be an alternative to Pokémon on the DS which is thus far exclusive to Japan. It supports Wi-Fi for on-the go monster battling with friends. For 500pts you can get something that looks like a Puzzle Bobble rip-off (with the bonus of getting your fortune told when you clear a board) from Gmode called Magical Drop Yurutto, the 3rd volume in Nintendo's Japanese crossword series Puzzle Iroiro Crossword House or a version of Othello called simply Othello from Arc System Works. None of these games have Wi-Fi support that can be seen. Finally there are three offerings for 200pts each: two Game and Watch titles from Nintendo (Helmet and Chef) and a grid-puzzle game from Tomcreate called Ura no Ura. Not a bad range of games, though the focus seems to be strongly on the casual side of things. That card battle thing sounds interesting... and when will we get game and watch? Joysound is finally coming, nice! I wasn't expecting Okiraku Tennis just yet. Hope it turns out good, though. Would be great if it had online like Family Card Games. I saw screens of Tomy Car Driver earlier in the week and it looks good. I wonder what Card Hero Custom Battle will be like. And yay for Game and Watch titles. I'm not jealous over VCA this week as none of those titles appeal to me - which is good; less reason to be upset over our releases (or lack thereof). Just had a quick look at Okiraku Tennis and the game only consists of a single-player mode against the computers, "Free Play" and "Special Rules" it seems (same setup as Table Tennis, I imagine). At the moment, there's no sign of anything else which could be a sign that even if the gameplay holds up, the game itself probably won't turn out to be good but maybe it'll turn out to be a surprise, who knows. Hay buy a Japanese Wii!! Sorted!!!!!!!!!!!!! I shall move to Japan for the sheer purpose of buying games. That's my plan. Not. Booho. yeah i'm jealous of Japan! @warioswoods: I cannot find any reviews of the disc release, however it uses the same song library (and has the same limited time access to downloaded tracks), so you should be able to find a trailer for that to get an idea. They should bring Card Hero over. Haven't they seen how successful TCG's are lately? Japan envy continues. They have 2 versions of Phelios and we have none and now Ninja Gaiden arcade! NOA this is how you do a virtual console. Hmm, you know whats better than a Karaoke game that cost 1000s of wii points to continue playing? One that doesn't. That karaoke game looks cool, but it seems expensive. The DSiWare card game looks great. Besides ninja gaiden and phelios two awesome classics! the rest is trash,people can have their garbadge dsi with it's crappy dsi-ware,im still trying to get some poor sap to buy my jap dsi which i've had long before it came here and it's region free,but it's still junk. Wow, I'd love the opportunity to play some of those DSiWare games, especially Card Hero. Card Hero Speed Battle Custom looks kinda cool, but since the west hasn't seen any of the Card Hero games, I'm not gonna to hold my breath. Of course, I don't have a DSi, so I don't know why I'm even mentioning it. Oh well. I said it before and I'll say it again, Hudson rules! Ninja Gaiden? Should be pretty badass! It actually seems like a very smart pricing model to me, if you want to occasionally throw a karaoke party for cheap with access to many tens of thousands of tracks. I'm all in favor of a service like that, but I doubt we have enough karaoke enthusiasm in the west to make the service fully viable. Well at least there are DSiWare something coming out. I would buy the Game and Watch Games. OMFG NINJA GAIDEN!!! ME WANTS!!! And to Europeans as Shadow Warriors! 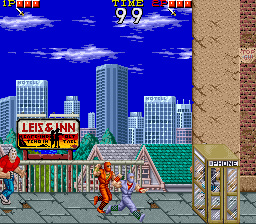 The arcade version of Nina Gaiden is much different than the Nes version. The arcade version is a beat'em up. I remembered playing Ninja Gaiden in a arcade in the early 1990's. I recalled liking it a lot. I it on the Atari Lynx. It is a tough but fun game imo. If they release the G&W and VC Gameboy on DSi I would buy 3 of them. And we need more epic VCA games. I don't understand the dearth of VCA titles outside of Japan myself. Most of the Namco games on offer had international releases, though the problem may be that many Namco arcade titles were published by Atari Games. It's possible there's rights issues still outstanding with games from the mid-late 80s and negotiations are being delayed because Midway (which bought Atari Games from Time-Warner in the 1990s) is going through the process of being taken over by Time-Warner Interactive. I'm just guessing of course, but take note that the Sega titles are being released much quicker -- relatively speaking! The arcade version of NG is so much better than the NES versions. Japan gets arcade Ninja Gaiden and a SECOND version of Phelios, and we get.... The Three Musketeers. Funny how no one remembers Card Hero with Maruo Maruhige on the Game Boy anymore. Of course, it was Japan only, but Maruhige was in Melee as a trophy. I wish that Nintendo would release GB, GBC, GBA, G&W, or GameGear games on the DSi.